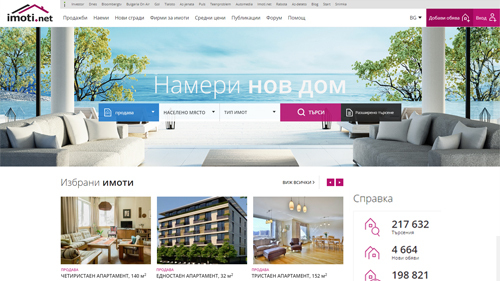 Imoti.net is the first site for properties in Bulgarian Internet space. Today Imoti.net has over 80 000 unique visitors per month, over 110 000 current offers for sale and rent, and over 980 active agencies and construction companies with listings on the site. The main objective of the portal is to facilitate trade in real estates and put it in a new modern platform.